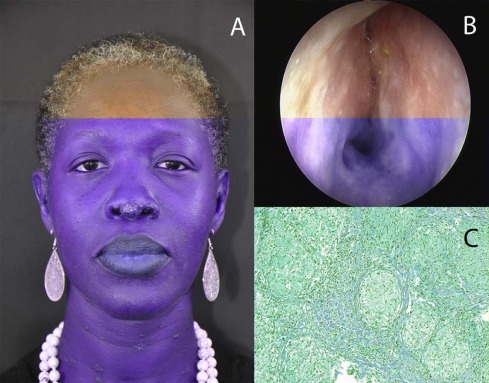 Skin and Nasal Involvement: Look for Sarcoidosis! July 5, 2018	 Comments Off on Skin and Nasal Involvement: Look for Sarcoidosis! (A) Skin impairment. Papulonodular skin lesions on the tip of the nose, from 3 to 10 mm, characteristic of sarcoidosis: firm, nonedematous, noninflammatory, nonpainful, nonpruriginous, with predominant facial involvement. (B) Endoscopic view (right nasal fossa) showing a major mucosae thickening. (C) Numerous uniform circumscribed nests of non-caseating granulomata which are characterized by the paucicity of lymphocytes and absence of necrosis. Sarcoidosis is a systemic, noncaseating, granulomatous disease affecting young adults between the ages of 25 and 40 years, most often of Black origin (35.5/100,000 vs 10.9 in the White population). Although the lower respiratory tract is affected in 90% of cases, ear, nose, and throat locations are very uncommon, with a prevalence varying between 1% and 6.5%.1 In addition, ear, nose, and throat manifestations are nonspecific, and may be difficult to differentiate from other granulomatous diseases such as actinomycosis, aspergillosis, antineutrophil cytoplasmic antibody-associated vasculitis and tuberculosis, thus, frequently giving rise to misdiagnosis and delayed treatment. A woman in her 40s, from Togo, was referred for nasal obstruction with skin involvement and left epiphora (Figure, A). She had biopsy-proven sarcoidosis with skin lesions (face, neck, thorax) and mediastinal and inguinal lymph node and cardiac involvement. She was successively treated with hydroxychloroquine, methotrexate, and corticosteroids that she discontinued on her own initiative 2 years previously. Her medical records also revealed inferior turbinate reduction. She has reported chronic sinusitis since the beginning of her disease. The clinical examination revealed 3 to 10 mm firm, nonedematous, noninflammatory, nonpainful, nonpruriginous, papulonodular skin lesions on the tip of the nose. Endonasal endoscopic examination showed severe rhinitis with total bilateral nasal obstruction and inferior turbinate hypertrophy (Figure, B). Biological tests revealed moderate lymphopenia (0.90 G/L, n = 1-4 G/L), predominantly on T-cells and polyclonal hypergammaglobulinemia. Angiotensin-converting enzyme dosage was normal. Histological examination performed on nasal mucosa showed the presence of granulomatous noncaseating infiltration; granulomatas were round, uniform, and composed of epithelioid histiocytes with abundant eosinophilic cytoplasm. Periodic acid–Schiff, Grocott, and Zielh stains were negative (Figure, C). A computed tomography scan revealed nasal fossae mucosae thickening. Oral corticosteroids and methotrexate at 15 mg/week were restarted to provide control over the general symptoms, but no decrease was observed in the skin and nasal impairment. In accordance with previous reports, the nasal symptoms were present at the onset of the disease and may have been worsened by inappropriate cessation of treatments.4 In cases with nasal papulonodular lesions, physicians should be aware of the need to search for sarcoidosis, especially when nasal or sinonasal involvement is present or in the event of previous history of sarcoidosis. If the diagnosis remains doubtful, internal medicine expertise, as well as a local biopsy, should be obtained. As mentioned by Kay and Har-El, functional endoscopic sinus surgery should be avoided in most cases, and the inferior turbinate reduction performed in our patient did not improve the nasal obstruction.5 However, despite the various medical treatments used in this patient (hydroxychloroquine, methotrexate, oral and nasal corticosteroids) complete disappearance of the ear, nose, and throat symptoms was never obtained, evidencing the difficulty of treating this sarcoidosis location. This article originally appeared in the July issue of The American Journal of Medicine.